Is anyone else loving all the bicycle decor going on these days? I'm really really loving it.....so much in fact that I created my own watercolor illustration. This is another one of those paintings that I'm not so sure I can bring myself to sell one day. I love it too much! I've still not been successful in finding a good place to make prints of my work. So for you other artists out there, where do you make prints? Do you go through an online service or somewhere local? Μου αρέσει πολύ η ζωγραφιά σου!Φιλάκια!!! Love the bike, too. In fact, I like the whimsy of your art and enjoyed looking through your blog. Oh wow! 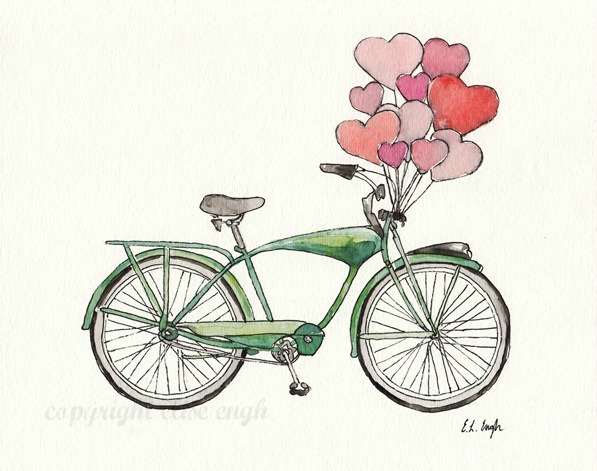 I love your lovely bicycle. :) Thank you for linking to my party! It's such a beautiful painting, I just pinned it on my bicycles board, as I have a small bike obsession right now.I came here from Frugal Friday. Such a beautiful picture. I like to print my work at Alphagraphics. Not sure if there is one where you live, but they have an ivory and white linen cardstock that is beautiful for paintings. Very nice, no wonder you want to keep it! That is so so cool. Keep it. I love it so much! I'd love to buy a print (or really the original, if you decide to sell it). So fun!